Arpita Singh was born in 1937 in Baranagar, West Bengal. In 1945 after her father’s demise her mother moved to Kolkata with her children. In 1946 the family moved to Delhi. In 1959 she received her diploma in Fine Arts from the Delhi Polytechnic’s Department of Fine Arts. Through the 60’s she worked at the Weaver’s Service Centre. In 1972 she had a solo show at Kunika Chemould Art Centre, New Delhi. In 1975 she showcased solo at Dhoomimal Art Gallery, New Delhi. In 1976 she had a solo exhibition at Pundole Art Gallery, Mumbai. In 1977 she had one person show at Werl, West Germany. In 1978, 1982 & 1985 she had solo shows at Art Heritage, New Delhi. In 1987 & 1990 she had solo exhibitions at Gallery 7, Mumbai. In 1987, 1990 and 1991 she showcased solo at Art Heritage, New Delhi. In 1993 she had a solo exhibition at Schoo’s Gallery, Amsterdam. In 1994 she showcased solo at Vadehra Art Gallery, New Delhi. 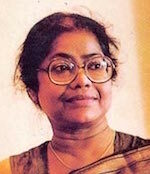 In 1996 she had one person show at CIMA, Kolkata. In 1997 she exhibited solo at Bose Pacia Modern, New York and Gallery Chemould, Mumbai. In 2003 she had a solo at Bose Pacia Modern, New York. In 2006 she exhibited solo at Vadehra Art Gallery, New Delhi & at the Museum, Mumbai. In 2012 she had a solo show at DC Moore Gallery, New York. In 1960, 1961 & 1962 she took part in ‘The Unknown’, New Delhi. In 1963 she showcased in ‘In Memory of Sailoz Mukherjee’ at Kunika Chemould Art Centre, New Delhi. In 1969, 1971 & 1972 she participated in Art Today at Kunika Chemould Art Centre, New Delhi. In 1972 she took part in ‘Two Painters’ at Gallery Chemould, Mumbai. In 1975 she participated in 3rd Triennale India at Lalit Kala Akademi, New Delhi. In 1977 she participated in Pictorial Space at Lalit Kala Akademi, New Delhi. In 1982 she took part in Contemporary Indian Art, Festival of India at Royal Academy of Arts, London. In 1982 she participated in a group exhibition at Covet Garden in London, UK curated and organised by Gallery 7, Mumbai. She participated in the 5th Triennale India at Lalit Kala Akademi, New Delhi. In 1984 she was showcased in Three Painters at Cymroza Gallery, Mumbai. In 1985 she participated in Five Indian Painters; Istanbul, Ankara and Belgrade. In 1986 she showcased in Roopankar Biennale at Bharat Bhavan, Bhopal; Festival of India, France and Centre Georges Pompidou, Paris. In 1987 she took part in Algiers Biennale, Algeria, 2nd Biennale in Havana, Cuba, Four Painters, Bhopal, New Delhi & Bangalore and in India at the Taj Hotel, Mumbai. In Geneva, Coup de Coeur and Halle Sud,Switzerland. In 1988 she showcased in ‘Watercolors by Four Painters’ at Jehangir Art Gallery, Mumbai and Contemporary Figurative Indian Art, Kuwait. In 1989 she took part in Through the Looking Glass at Centre for Contemporary Art, New Delhi; Artist Alert SAHMAT, New Delhi and Timeless Art, Times of India, Mumbai. In 1990 she participated in Nine Indian Contemporaries at Centre for Contemporary Art, New Delhi and Habitat Gallery at Habitat Centre, New Delhi. In 1991 she showcased in Helpage India, Mumbai. In 1992 she participated in Husain Ki Sarai at Vadehra Art Gallery, New Delhi. In 1993 she showcased in India Songs, Art Gallery of New South Wales, Sydney; ‘London: Indian Encounters’ at Gallery Madras; ‘Two Artists’, Washington DC; ‘Wounds’ at Centre for International Modern Art, Kolkata. In 1994 she showcased in Drawing 94 at Gallery Espace, New Delhi and ‘Mobile Crèches: Art for Children sake’ at Habiart Centre, New Delhi. In 1996 she participated in Traditions/Tensions at Asia Society, New York and ‘Chamatkara’ in London (organised by Centre for International Modern Art, Kolkata). In 1997 she took part in The Self & The Word at the NGMA, New Delhi. In 2002 she participated in ‘Ways of Resisting, SAHMAT’ at Rabindra Bhavan, New Delhi. In 2004 she showcased in Stree at Bodhi Art Gallery, New Delhi. In 2005 she showcased in Endless Terrain, Rabindra Bhavan and the Lalit Kala Akademi, New Delhi. In 2006 - 2007 she showcased in ‘Inventing/Inverting Traditions, Indian Art II/III’ at Grosvenor Vadehra, London. In 2007 she participated in ‘Horn Please: Narratives in Contemporary Indian Art’ at Kunstmuseum in Berne, Switzerland; ‘Tiger by the Tail! Women of India Transforming Culture’ at Women’s Studies Research Centre at Brandeis University, USA & ‘Making History Our Own’ at AIFACS, New Delhi (organised by SAHMAT). In 2007-2008 she participated in India Art Now: Between Continuity and Transformation at Province of Milan, Italy. In 2008 she took part in ‘Moderns’ at Royal Cultural Centre in Amman, Jordan (organised by Lalit Kala Akademi, New Delhi); ‘Freedom 2008: Sixty Years after Indian Independence’ at Centre for International Modern Art, Kolkata and ‘Fluid Structures: Gender and Abstraction’ at Vadehra Art Gallery, New Delhi. In 2008 - 2009 she participated in ‘Modern India’ organised by Institut Valencia d’Art Modern and Casa Asia at Valencia, Spain. In 2009 she showcased in ‘Bharat Ratna! Jewels of Modern Indian Art’ at the Museum of Fine Arts, Boston and in ‘Kalpana: Figurative Art in India’ at AICON Gallery, London. In 2010 she participated in ‘Symbols & Metaphors’ at Centre of International Modern Art, London; ‘Paper Trails’ at Vadehra Art Gallery, New Delhi and the ‘Modernists’ at RL Fine Arts, New York. In 2011 she took part in ‘Ethos V: Indian Art Through the Lens of History (1900 - 1980)’ in Singapore; ‘Fabular Bodies: New Narratives in the Art of the Miniature’ at Coomaraswamy Hall, Museum, Mumbai. In 2012 she showcased in ‘Women in Between: Asian Women Artists (1984 - 2012)’ at Fukuoka Asian Art Museum, Japan and ‘Extending the Line’ at Vadehra Art Gallery, New Delhi. In 2013 she participated in ‘Midnight to the Boom: Painting in India after Independence’ at Peabody Essex Museum in Salem, Massachusetts. In 2014 she showcased in ‘Is It What You Think?’ at Kiran Nadar Museum of Art, New Delhi. In 1991 she received Parishad Samman from Sahitya Kala Parishad, New Delhi. In 1998-1999 she received Kalidas Samman in Bhopal, Madhya Pradesh. In 2011 she was awarded the Padma Bhushan by the Government of India, New Delhi. Arpita lives and works in New Delhi.